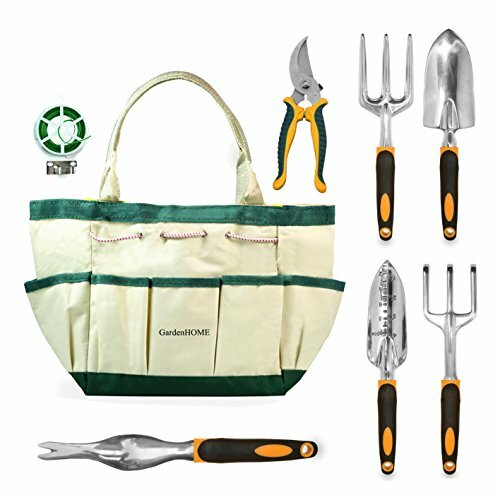 Our new and improved GardenHOME 8 Piece Garden Tool Set is designed for serious gardeners. Gardening gurus will love the convenient, grab and go storage tote with multiple pockets, perfect for transporting your tools. Our 6 piece ergonomic gardening tools are heavy duty, ensuring durability for many seasons of use. The tools have soft grip handles to reduce stress on the hands, perfect for hours of gardening. This tool Set is the perfect gift for those who love to work in the great outdoors. If you have any questions about this product by GardenHOME, contact us by completing and submitting the form below. If you are looking for a specif part number, please include it with your message.